If you have zoysia, then you already know how beautiful, thick, and healthy the lawn can be. It has many wonderful benefits, but it also has a few down sides as well. One such down side is in the spring. If you live in a section of the country that has very cool spring weather, then you know it can get quite weedy with cool season weeds. It is fine to use a variety of weed control products to keep weeds under control. There is a week to ten day period when zoysia grass is just beginning to break dormancy that 2,4-D weed killer can harm it. After that period, 2,4-D can be used again. Read the label carefully. Although I practice spot spraying using liquid herbicides, I would think the granular weed and feed products would merit the same concern. Keep in mind that Centipedegrass and St. Augustinegrass have herbicide restrictions as well. If a lawn care company takes care of your lawn, make sure you ask them what they are using. Companies that use liquid fertilizers will usually mix a herbicide with the fertilizer so you get both in one application. You may need to delay the application for another week if the grass is just beginning to green up just to be safe. One thing you can do to help keep spring weeds down is to use a preemergent. The preemergent must be applied before the weed seeds germinate. A good preemergent such as Gallery is good for broadleaf weeds. Dimension, Halts and other brands are not as good on broadleaf weed seeds, but do a good job against crabgrass. Do not exceed the recommended rates of application. In turf studies, injury to zoysia grass occurred when rates heavier than recommended were applied . Others have asked about using a non-selective product such as Round-up on zoysiagrass and bermudagrass when the grass is dormant in winter. The idea is to control the weeds, but not harm the grass. This is the theory behind it: When zoysia and other warm season grasses are dormant there is no activity within the plant. So spraying round-up on the lawn in late winter or early spring will kill the green weeds and cool season grasses which are growing, but leave the turfgrass unharmed. It is a risky adventure and I would definitely do a test area first. 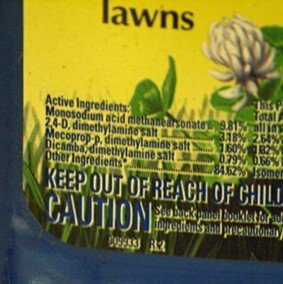 Round-up, therefore, is thought to be safe to use and can be sprayed on the grass without harm. While the theory is basically true, you have to be absolutely sure the grass is completely dormant or you may be shocked when spring arrives. The other option is to remove the clumps by hand. Fescue is a bunch grass, meaning it does not spread. Pulling it up is much safer and you avoid any costly errors, but may be time consuming. Turf type tall fescue growing in common bermudagrass is not a problem as long as the grass is maintained about two inches in height. The blade size and height of the two grasses are fairly compatible. Many people over-seed bermudagrass with ryegrass or turf type tall fescue in the fall to keep some green in the lawn through the winter. Many types of herbicides are available from organic to chemical products. Choosing the right one is important. Click here for information on the different types of herbicides, how the work, and types of formulations.